March Story Volume 1 cover image. 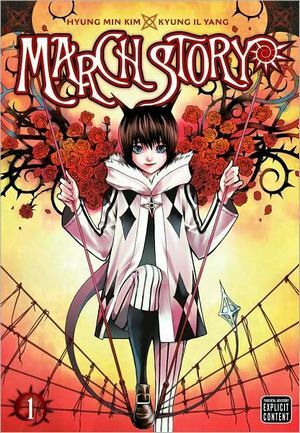 VIZ Media, LLC (VIZ Media), one of the entertainment industry’s most innovative and comprehensive publishing, animation and licensing companies, will release the supernatural manga (graphic novel) series MARCH STORY on October 19th. The latest addition to the VIZ Signature imprint, by Hyung Min Kim with artwork by Kyung Il Yang, is rated ‘M’ for Mature readers and will carry an MSRP of $12.99 U.S. / $16.99 CAN. Among the quiet villages and towns of 18th century Europe, demons known as the Ill hide within the most beautiful works of art and are sparked to life by the torment of their creators. Attracted by their jewel-like allure, unwary viewers can find themselves possessed by the Ill and will be driven to horrific acts of violence. Only the hunters of the Ciste Vihad can dispel the Ill. March is one such hunter, tracking the Ill from town to town to find the antiques that contain the demons before they can possess anyone. If the worst has come to pass, March’s full powers are unleashed to battle the fiendish Ill. Writer Hyung Min Kim was born in Jinju, Korea. In 2002 he entered the manga world, and in 2007 he debuted as a storywriter with MARCH STORY, originally published in Japan in Sunday GX. Artist Kyung Il Yang was born March 26, 1970. His debut work, Soma Shinhwa Jeongi, appeared in Weekly Shonen Champ in Korea. Notable works include Zombie Hunter (original story by Kazumasa Hirai) and Shin Angyo Onshi (Blade of the Phantom Master, original story by In Wan Youn). Yang also works on Defense Devil, currently serialized in Weekly Shonen Sunday.